This is an apple that can certainly be called the “Fairest of the fair”, the sweet and lovely Winter Banana. With its smooth, waxy, pale yellow skin and pinkish-red blush, the Winter Banana is an extremely attractive apple as well as a beneficial addition to the home orchard. Winter Banana is a diploid, self-fertile apple, meaning that it not only pollinates itself, but also serves as a very effective pollinizer for other apple trees. Very few apples are self-fertile like Winter Banana and so require pollen from other apple varieties for proper cross-pollination and successful fruit production. Self-fertile varieties such as Winter Banana, Cox’s Orange Pippin and Grimes Golden can play an important role in helping increase production and yield in smaller orchards with limited varieties. Winter Banana originated around 1875-76 on the farm of David Flory of Cass County, Indiana and was introduced commercially in 1890. (One of its nicknames is “Flory”). 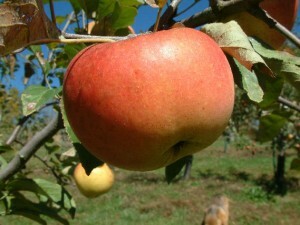 It is a fine fresh-eating apple with a mild, sweet flavor and is best enjoyed as a dessert apple. The mildness of its flavor makes it less desirable as a cooking or baking apple. It is a highly aromatic apple with a pleasant, perfumed aroma that some people discern as banana. Not everyone can detect the aroma of bananas and only the highest-quality, well-ripened fruits will have this fragrance. I have enjoyed Winter Banana on numerous occasions and seldom detect the “essence” of banana but do recall a time in 1990 when our Winter Banana tree was hanging heavy with an especially abundant crop of beautiful, pink and golden-yellow, aromatic fruit. I was walking up to the orchard on a warm day in early October and well before I could actually see the tree, I detected the heavy, sweet perfume of fresh bananas permeating the entire orchard! I picked an especially attractive apple from the tree, enjoying the cool feel of the fruit in my hand on that warm early fall afternoon. I held it close to my nose and inhaled deeply to savor the full, rich aroma of ripe bananas. What a marvelous experience! To this day I have not enjoyed a Winter Banana apple that matched the sensory experience of that one apple on that particular day! For the grower Winter Banana has numerous advantages which make it a valuable addition to the orchard. It is a late bloomer, a trait which can protect it from the occasional late spring freeze and is quite a precocious apple, often producing fruit in the second or third year after planting. It is a low-chill variety which can be raised successfully in warmer regions with mild winters and fewer chilling hours. However, like any other apple, Winter Banana also has a few shortcomings. Because of its thin skin, the fruit bruises easily and the tree is susceptible to cedar-apple rust. Without proper thinning the tree is prone to bearing smaller crops on alternate years and the apple is only a fair keeper, although with proper refrigeration it can be safely stored for 3-4 months. If you’re looking to add something different to your home apple orchard, then Winter Banana is well worth considering. 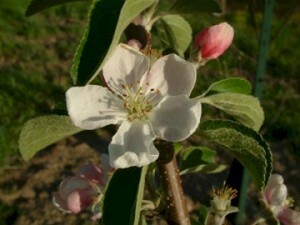 With its unique aroma and flavor and outstanding beauty this apple will delight the senses and give great pleasure for many years. My Grand Parents made a lot of money growing WAinter Bananas In the early 1900’s, they and thier family sorted, polished and pscked them in the orvhard and shipped them to the midwest and eastern markets where their beauty was irristable. In the 1920’s washing,sorting and packing was done mechanically,no mstter how slow they ran the equipment, the delicate thin skinned Winter Bananas came out badly brused and unmarketable. This apple was then relegated to just being a pollinizer for the Delicious,Winesaps and Spitzenbergsat the orchards here in Central Washington. You bring up an interesting point about the wonderful Winter Banana. While it is a terrific apple for the homeowner and small orchard operations, it never gained significant favor with shippers and larger commercial growers due to its tendency to bruise so very easily. As you noted, with its delicate, thin skin, it could never withstand the rigors of sorting and packing, no matter how much care was taken in the process. However, it is an extremely effective pollinizer and is widely grown in commercial operations for just that purpose. Still, for its overall beauty, mild, pleasant flavor and alluring aroma, Winter Banana is one of the best. One of the treasured apples in our orchard in Santa Barbara, Calif. It definitely does well for us and is indeed both a beautiful looking apple and a beautiful tree. Thanks for sharing your comments about this wonderful apple, Larry. Anyone who has enjoyed a fresh, aromatic Winter Banana would most certainly agree with you! Thanks again. Do you have any winter banana trees or apples?